The watchmaking company Urwerk celebrates its 20th birthday in 2017 – in style of course. Frei & Baumgartner, the founders of Urwerk, presented their new company and their first watch at the Baselworld 1997, causing quite a stir. And even two centuries later, it doesn’t get boring with Urwerk. The new UR-T8 which marks the companies 20th birthday was presented at the SIHH. This watch proves the enormous creativity and the aspiration of Frei & Baumgartner to revolutionize how we think about wristwatches. The way in which the time is displayed as well as the shape of the case is once more unique – and a novelty. 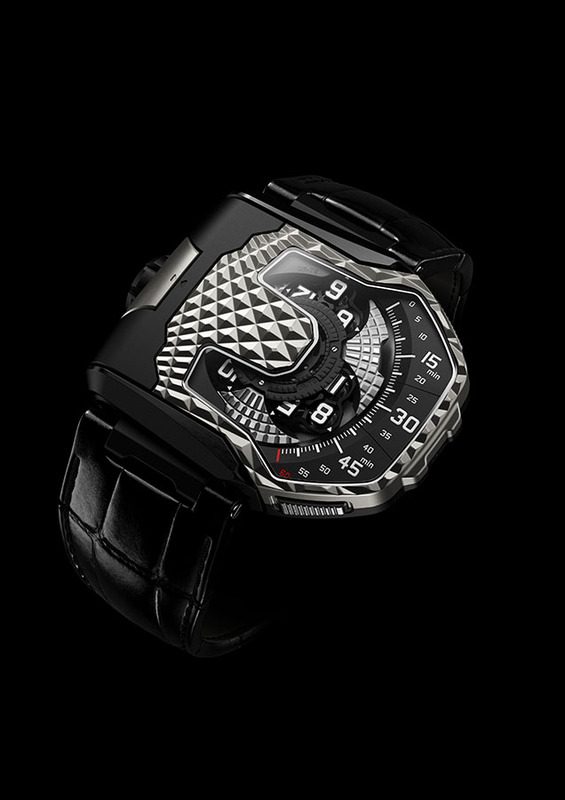 The UR-T8 is Urwerk’s first transformable watch – inspired by the iconic Jaeger-LeCoultre “Reverso”. A Series of precise actions unlocks the case from its cradle, flips it over and returns it with a satisfying click. It then becomes a mysterious object on the wrist. There are two pushers on the bezel which, when pushed simultaneously, lift the watch vertically. It then can be rotated about its axis before clicked back into its cradle to return to the present time. From one side, the UR-T8 is watch, from the other one is a futuristic design piece which resembles a watch only partly since the time display is completely gone. 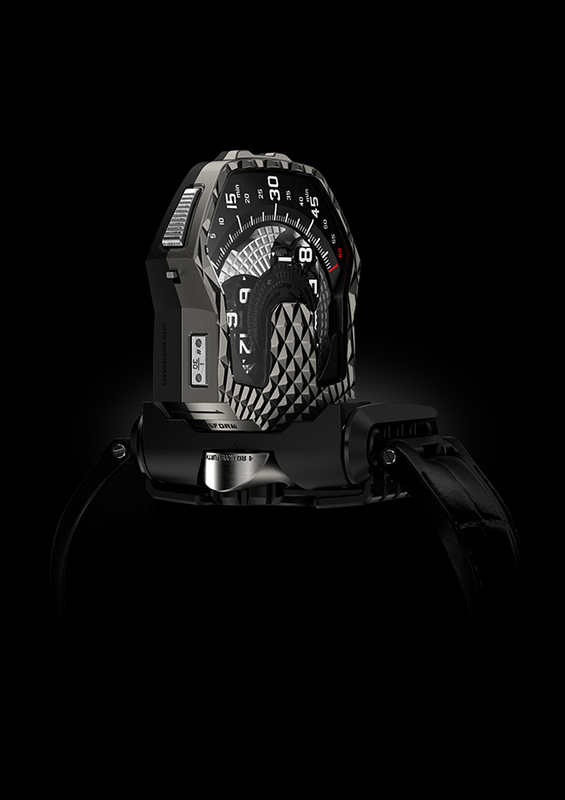 Urwerk has a new version of its trademark wandering-hour indication in the UR-T8. This intuitive display arranges the twelve hours in groups of four on a three-armed carousel. These successively sweep across the scale of 60 minutes to show the time both digitally and analogically. It is the biggest and most elaborate carousel configuration yet applied by Urwerk, with each arm supporting a satellite carousel bearing the four numerals. A complex planetary gearing transforms a tangle of wheels, screws and jewels bearings into a meticulously orchestrated ballet. 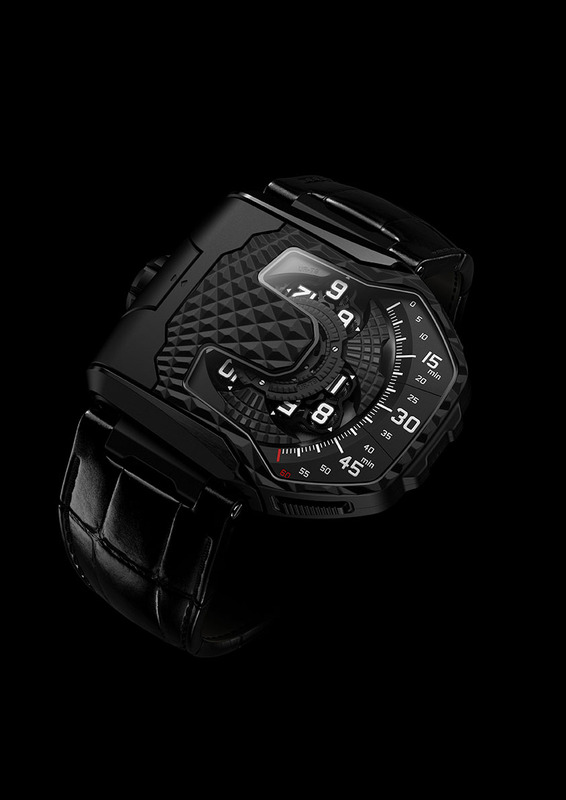 The Urwerk UR-T8 features a unique pneumatic control of the self-winding system. A spinning vane connected to the winding rotor absorbs any sudden and violet movements of the rotor without compromising its winding efficiency. The watch is powered by the calibre UR 8.01. It works at a frequency of 4 Hz and provides a power-reserve of 50 hours. 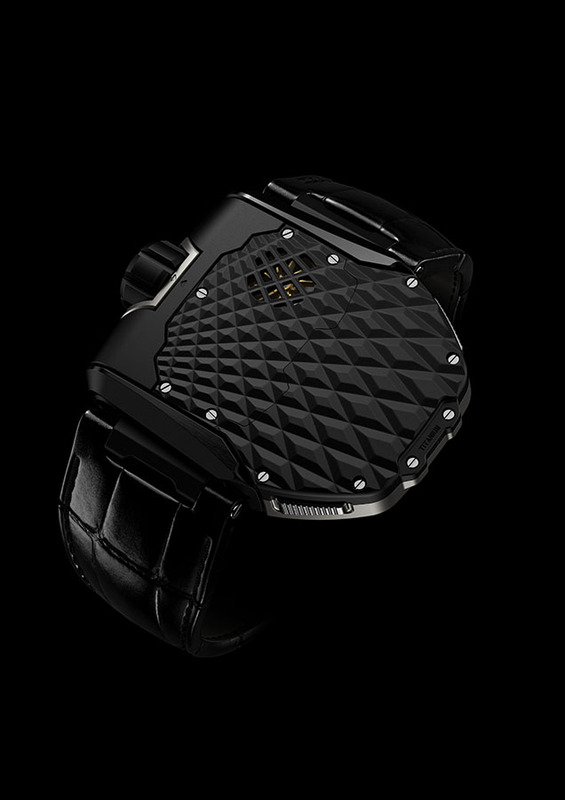 The case is made from titanium with a black PVD-coating and it measures 60.23 x 48.35 x 20.02 mm. Of the UR-T8 will only be 60 pieces available. This entry was posted in Automatic Wristwatches, Mens watch and tagged automatic movement, design, Men's Watch, SIHH 2017, titanium, Urwerk, wristwatch by admin. Bookmark the permalink.